We visited The Butterfly Charities for free for review purposes. Any and all opinions expressed here are our own. Mom's view: If you want to experience nature in a small setting, The Butterfly Charities is perfect for you. Here you can not only see beautiful butterflies but fish, birds, and pretty flowers as well. This is not only a place where you can view nature you may get to interact with nature as well. You can hold a butterfly on your finger or feed fish. You may even get to name a dove. If you are looking for a place to spend a long time, this is not it. However, if you are interested in a place that you can go to for a quick respite from the daily grind or short visit with nature, this is a great choice. For more information go to http://thebutterflycharities.com/. And that's Mom's view. For younger sister, Aurella's view tune in to tomorrow's Talking Topics post. We have received some items free from Wholesale Halloween Costumes for review purposes. Any and all opinions expressed here are our own based on our experience. Me- Today I am recommending Wholesale Halloween Costumes. They have some really great costumes for all ages and interests. They prices are really good too. Mom- Today I am also recommending Wholesale Halloween Costumes. If your family is like ours, I am sure finding Halloween costumes can be a quite a chore. It is often hard to find costumes that are in stock or can be delivered on time, are reasonably priced, and that your children actually like and want to wear not only when they see it in the store or on-line, but actually still love and want to wear even when they get it home. Wholesale Halloween costumes takes care of all of these issues. They have a large selection of costumes for all ages and size including adults. Their prices are good with many costumes priced at less than $45. Their service and delivery are also excellent. My daughters can be especially picky about Halloween costumes so I love that Wholesale Halloween costumes offers so many choices. My younger daughter loves animals. She loved the 50's costumes because she loved the poodle skirts. She chose a child's 50's dress that came with a scarf and a belt. The costume and its included accessories arrived within a week of ordering them. It fit nicely which was a relief since fit is always something to worry about when ordering on-line. It was well-made and not one of those flimsy costumes that look and/or feel like they is about to fall apart or rip the minute you put them on or sometimes even the minute you take them out of the package. The costume looked as good when it arrived, and my daughter tried it on as it did on the web page. We really appreciated that since that is not always the case when you order Halloween costumes on-line. We would definitely order costumes from Wholesale Halloween Costumes again. They make the whole Halloween experience so much easier. And that's our view. Tune in tomorrow for Where-To-Go Wednesday. Me - My topic for this month is why friends, Monica and Chandler were such a great couple. They were so cute together. Their personalities matched really well. Even in early episodes when they weren't together they seemed like a couple.They always had a connection . Once they got together, they made each other better people. Even though alone at times there could be annoying things about their personalities together those things weren't as bad.They toned each other down. Also, unlike Rachel and Ross, they were never on a break and never broke up. They were definitely the best couple on friends and one of the best TV couples ever. My topic for this month is getting older. I hate getting older. It just seems like time goes by so fast. Yesterday, I was the mother of two little girls and today I am the mother of a tween and a teen. I love my girls as much as ever, but sometimes, I miss when they were little. It feels sad not having a little kid in the house. Even the cats are growing much too fast. Yesterday, they were just little kittens that we had just brought home from the SPCA, and now they are already two year old cats. As for me, from the time I got out of college, until just recently I have always felt the same, I've only just recently started to feel a little older and to notice how much older everyone around me has gotten too - my husband, my parents, other relatives and friends. Nobody is immune to time. And that's our view. What's on your mind? Tune in tomorrow for Tips for Tuesday. Hosted By Tammie's Reviews, Giveaways and More and Deliciously Savvy . Participating in Burgers for Better Schools is as easy as becoming a member of Red Robin Royalty. Red Robin Royalty members can sign up for Burgers for Better Schools on their account dashboard on Red Robin’s website or by visiting http://www.redrobin.com/betterschools. If you are not already a Red Robin Royalty member, sign up for free and select your child’s school BEFORE your visit! This Sweepstakes will end on 10/10/2015 at 7 p.m. Winner will be notified by email and have 24 hours to respond or another will be chosen. pankuch1605@hotmail.com is the email it will come from. Disclosure- Says Me Say Mom was not compensated either by free product or payment. I have not been compensated for this post. All opinions and experiences are my own. Open to the US, must be 18+. Confirmed Winner(s) will be contacted by email and have 24 hours to respond before a new winner will be drawn. No purchase necessary. Void where prohibited by law. Entrants must only enter with either one email address, IP address and/or Facebook account, anyone found violating these rules will be disqualified. It is at the sole discretion of the admin of the giveaway if the winner has met the rules or not. The sponsor(s) will be responsible for product shipment to winner(s) of the giveaway. Sponsor will be responsible for prize fulfillment. This event is in no way associated with, sponsored, administered, or endorsed by Facebook, Twitter, Google, Pinterest or any other social media network. The disclosure is done in accordance with the Federal Trade Commission 10 CFR, Part 255 Guides Concerning the use of Endorsements and Testimonials in Advertising. For questions about this giveaway or to have me promote your product, Please email Tammie at info@tpankuch.com. Take a 2.5 hour cruise up the Hudson enjoying the autumnal sights and our new Onboard Oktoberfest with live music and German food and beer specials up to Bear Mountain State Park. You’ll hop off the boat there, where for 3 hours, you can enjoy the park’s 50+ hiking and biking trails, paddle around the lake, visit the Bear Mountain Zoo, brunch at The Bear Mountain Inn and take in the general splendor of nature and fall weather. Last day of sales most items 1/2 price! October 2 – 31, 6 - 9 pm – Spooky Mini Golf – Philly Mini Golf is transformed into spooky fun for the season with fog, lights, music, and surprises (Fri., Sat., and Sun. evenings) ($9 adults, $7 children). October 24, noon - 3 pm – Pumpkin Patch – Pick a pumpkin out of the Pumpkin Patch and decorate it to take home, FREE for children 10 and under. (Group reservations and participation not available.) Also, the Lightning Bolt Express Train makes the traditional fall stop in the Square ($5 adults, $4 children). October 24, 4 - 10 pm – OktoberFestivus – Enjoy some of Philly’s finest food trucks, activities, and a summer beer garden presented by Barren Hill Brewery. Admission is free, with food and beverage available for purchase from participating vendors. October 31, 12 noon - 3 pm – Trick or Treat Trail – Decorate your very own Trick or Treat bag and follow the map to the Trick or Treat Trail stops in the park. FREE for children 10 and under. Group reservations and participation are not available. Also, the Lightning Bolt Express Train makes the traditional fall stop in the Square ($5 adults, $4 children). For more information go to http://historicphiladelphia.org/franklin-square/what-to-see/. A Night of Rock and Roll to benefit the Homeless. in blending the vocal layering and studio precision that is a signature of the band with the energy and spectacle of a live stage production. Elaborate lighting, effects and costumes aptly frame the seasoned musicians who step into these very large shoes to effectively render an authentic "Queen experience". The band can boast an unbroken string of sold out theaters from New York to San Diego, while headlining major rock festivals in a number of foreign countries as well as the US. Get the best seats in the house with VIP tickets. Now is your chance to grab center ringside seats to their new show. VIP Limited so order now! New York Theatre Ballet will perform Legends & Visionaries 2015 from October 1-3, 2015 at Danspace Project, 131 E. 10th Street, NYC. Performances: Thursday, Friday and Saturday at 8pm. A Season Opening Event will take place on Thursday at 7pm in the garden. Tickets are $20 ($15 for Danspace members), and are available online at www.danspaceproject.org or by calling OvationTix/TheaterMania at 866.811.4111. To attend the Season Opening Event, email admin@nytb.org or call 212-679-0401. Brooklyn Center for the Performing Arts at Brooklyn College is pleased to announce its 2015-16 music series. This year's lineup includes 61st Season opener Michael Feinstein, a children's favorite Black Violin, a reimagining of Sgt. Pepper's Lonely Hearts Club Band by Art of Time Ensemble, a holiday concert by Vienna Boys Choir, Robert Glasper Trio, a jazz violin virtuoso Regina Carter, and a tribute to Nat King Cole featuring Ramsey Lewis and John Pizzarelli. These musical events reflect the artistic excellence and cultural diversity to which Brooklyn Center is dedicated. Tickets to Brooklyn Center's music series range from $18-$65 and can be purchased at BrooklynCenter.org or by calling the box office at 718-951-4500 (Tue-Sat, 1pm-6pm). Emmy- and Grammy-nominated entertainer Michael Feinstein brings his impeccable piano skills and unparalleled interpretations to some of the greatest selections in the entire American Songbook, peppered with personal anecdotes from his autobiographical book The Gershwins and Me, which reflects upon his six-year collaboration with the great Ira Gershwin. Tickets $18Back by popular demand, virtuoso violinists Kev Marcus and Wil B return to Brooklyn with their electrifying mash-up of hip-hop, classical, and pop tunes. With appearances ranging from the Apollo Theater and the Billboard Music Awards to three NFL Super Bowls and President Obama's official Inaugural Ball, this dynamic duo never fails to take audiences by storm with their unique spin on music for strings. With hits including "When I'm Sixty-Four," "With a Little Help From My Friends," and the title song, The Beatles' Sgt. Pepper's Lonely Hearts Club Band has been designated "the most important rock and roll album ever made" by Rolling Stone magazine. Toronto's Art of Time Ensemble brings this iconic collection to life in a fusion of high art and pop culture that reveals the universal and timeless qualities that lie at the heart of all great music. This illustrious group of young musicians has been delighting music lovers across the globe for six centuries with their purity of tone, distinctive charm, and crowd-pleasing repertoire. Christmas in Vienna showcases these gifted musicians in an extraordinary program featuring Austrian folk songs, classical masterpieces, popular songs and, of course, holiday favorites. More than ten years after making his debut at the legendary Blue Note, 2015 Grammy-winning pianist Robert Glasper graces the Whitman stage with an intimate concert combining original jazz compositions and selections from his June 2015 album Covered, which draws from some of Glasper's favorite songs by artists including Joni Mitchell, John Legend, and Radiohead. As a singer, Nat King Cole was called "the best friend a song ever had," but he was essentially a jazz performer at heart. Three-time Grammy Award-winning pianist Ramsey Lewis and singer/guitarist John Pizzarelli join forces in this tribute to the titan of fifties vocal pop, performing favorites including "Route 66," "Mona Lisa," "Unforgettable," and more. SATURDAY, OCTOBER 17 - 11:00 A.M. Best-selling children's recording artist and preschool television favorite Laurie Berkner and The Laurie Berkner Band are thrilled to bring their "Greatest Hits Tour" home to Manhattan, with a family show at 11:00 a.m. on Saturday, October 17 in The Concert Hall at the New York Society for Ethical Culture, 2 West 64th Street, New York, NY. News from O & M Co.
Clear Channel Spectacolor and New York Comic Con will kick off New York Super Week with the second annual “Celebrity Karaoke: A Epic Evening with the Stars,” Monday, October 5, 2015 at 7 p.m. (doors open at 6:30 p.m.) at Hard Rock Café Times Square (1501 Broadway). Hosted and co-produced by Justin Guarini, currently starring in the world-premiere musical comedy Moonshine: That Hee Haw Musical, “Celebrity Karaoke” gives Comic Con and Broadway fans the opportunity to perform with a live karaoke band alongside Broadway’s brightest stars. Chart-topping R&B singer/songwriter Deborah Cox will lead the roster of stars with additional performers to be announced soon. Tickets are $40 for VIP floor seats and $25 for general admission, and are now on sale via TicketWeb here. A portion of the proceeds from the evening will benefit Random Acts Org, a US-based, global nonprofit that strives to conquer the world, one random act of kindness at a time. The organization inspires individuals and groups to come together and help improve the overall well-being of their communities. Random Acts will use this opportunity to benefit Community Soup Kitchen and Outreach Center and will accept non-perishable food donations at Celebrity Karaoke. Tony Award-winning producer Jayne Baron Sherman (Hedwig and the Angry Inch) and Tony Award nominees Dan Markley(Something Rotten) and Carl Levin (Rock of Ages) will judge the performances. At the end of the night, the judges will select one winner who will receive an incredible prize package to help further their goals of stardom. The package will include a private voice lesson with Justin Guarini, a sit down with the panel of Broadway producers, a work session with a top NYC casting director, and a headshot session with NYC photographer Nathan Johnson. Additionally, the winning performance will be broadcast on one of Clear Channel Spectacolor’s billboards in Times Square with full color and audio. To enter, aspiring singers should record a performance of themselves singing their favorite karaoke song (Broadway and/or rock) and upload it to YouTube. Video submissions should be under three minutes and submitted to BroadwayWorld.com via the contest landing page here. Submissions will be accepted through Monday, September 28, 2015. BroadwayWorld.com will select two guaranteed slots from the submissions. All contestants must be able to provide their own transportation to New York City’s Hard Rock Café in Times Square on October 5, 2015. And that's the scoop. Tune in Monday for another Talking Topic. 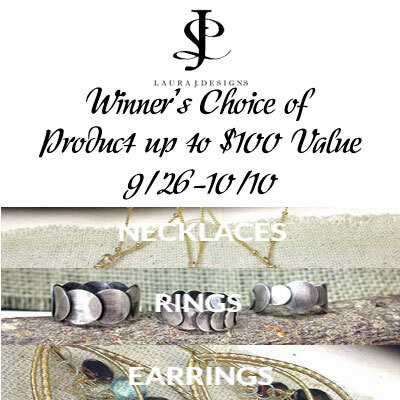 Giveaway: Win Jewelry from Laura J. Designs Up to $100.00 Value! Laura J Designs is a company selling modern, yet timeless Artisan jewelry for the fashion-conscious women who appreciate their uniqueness. Most of their clients are re-sellers: upscale shop owners, Galleries, Catalogs featuring handmade craft, Boutiques and Museum shops, but they do work with private customers as well. Their jewelry is all hand wrought from conception of design to production: including creating the shapes for designs, soldering, polishing, hammering with different textures and connecting stones with wire wrapping. They use Sterling, 14K Gold Filled and semi-precious gemstones. All of their creations are designed by Laura and made in her Philadelphia Studio by herself and a team of two crafty ladies. Says Me Says Mom was not compensated for this giveaway and is not responsible for prize fulfillment. Giveaway: Win a VW Camper Vam Kid Play Tent! Giveaway: Win a $75.00 Amazon Gift Card!